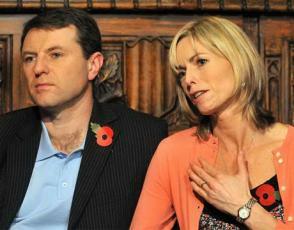 Emotional McCanns deny 'pact of silence' on Maddy. Kate and Gerry McCann were grilled yesterday for the first time about allegations they could have been involved in their daughter's disappearance. Portuguese police had previously named the couple as "arguidos", or formal suspects, in the case in September 2007. But the McCanns, both 41, have always strenuously insisted they are innocent, and their suspect status was lifted when the authorities in Portugal shelved the case in July last year. However, last night Sandra Felgueiras, a reporter for Portuguese TV station RTP, questioned the McCanns about claims made in a book by Goncalo Amaral, the former detective in charge of the investigation into Madeleine's disappearance. The couple took legal action against Mr Amaral and in September Lisbon's main civil court banned further sale or publication of his book. The McCanns were visibly frustrated by the course of the RTP interview, which included questions about the findings of sniffer dogs brought in to search their apartment in Praia da Luz and whether they had close links to the British government. Ms Felgueiras quizzed them on claims there was a "pact of silence" between the couple and friends on holiday with them when Madeleine disappeared. Mr McCann explained that there was no pact, but they had all refused to talk to the media about what happened that night in line with Portugal's strict judicial secrecy laws. The journalist also asked if they felt they were victims of the Portuguese investigation, to which Mr McCann replied: "The victim is Madeleine." Ms Felgueiras said afterwards: "It is two-and-a-half years after Madeleine disappeared and this was the first time they talked to us in a big interview since the files were closed. I think I should feel free and they should feel free to talk about it. It would be the only chance to clear up the rumours." But Mr McCann insisted that: "The place to have those discussions is in the judicial and legal environment where they can be properly assessed and dealt with within the bounds of the law. "That's the approach that we've taken, and clearly we're very pleased that the Portuguese judiciary have agreed that there is absolutely no evidence that Madeleine is dead or that we were involved, and that's why injunctions have been given. "If people accept that, then they will accept that Madeleine is missing and can still be found." Earlier Gerry McCann told how the couple's four-year-old twins have started saying they want to find and fight the person who took their missing sister. Sean and Amelie were just two when Madeleine vanished. But their parents have discussed the fact that their big sister is missing with them and they are now fiercely protective of her. The McCanns were speaking as police released a video showing how Madeleine might look now, in a bid to prick the conscience of anyone who knows what became of her. The 60-second video, released in seven languages, features film footage of Madeleine and digitally enhanced photos of what she might look like now with shoulder-length blonde hair, as well as one with a tan and dark hair. The clip, produced with the aid of psychologists, can be viewed at www.ceop.police.uk. mpting the conscience of an individual who is keeping a secret," said Jim Gamble, head of the Child Exploitation and Online Protection Centre. Mr McCann hailed the global online appeal as "a world first". "We're optimistic that this message will get to them, it will cause them to wrestle with their conscience," he said. Sandra: Hello Kate, Hi Gerry. You have called us here, or invited us here to show these two new pictures of how Madeleine might look like now at the age of six and also to watch a video, a new appeal video, but you have been recently together in Lisbon. Have you truly felt that the Portuguese public opinion is still with you? Gerry: I think obviously there has been a lot written that is very negative, and ehm it is inevitable that given so much..., so much was written negative about us, that some people felt that we were involved, that we do feel now, that legal action has been taken and the judicial process has seen that there is no evidence to support what has been written. Sandra: You are talking about Goncalo Amaral's book? Sandra: But how can you explain that Goncalo Amaral has sold over 175.000 copies defending that you played the key role in Madeleine's disappearance? Sandra: Do you believe that the public opinion in Portugal right now after reading the book of Goncalo Amaral erm still can support you? Still can answer to that appeal? Gerry: Now that's the key point why we Are Taking action Sandra and that is part of the legal process as you know. There is a already an injunction out against the book he's banned from repeating his thesis that Madeleine is dead and we were involved. Now that has been two separate judges plus the original judge on file file have said that that. That's what we will do with discussing the facts. Thats the correct place to discuss. Goncalo Amaral and the book..
Sandra: Are you saying that Goncalo Amaral doesn't have the right to share his opinion, his conviction under the evidence he gathered into a book? He doesn't have freedom of expression to say that and to publish it? Sandra: The files were closed and no thesis won. How can you explain that after Goncalo Amaral, Paulo Rebelo, the next investigator, also pursued this thesis? He also investigated the possibility of you both play the key role in Madeleine's disappearance? Gerry: The DNA is only one aspect of it, there was no evidence to support our involvement in Madeleine's disappearance, that is the key thing. Madeleine is still missing, we are here as her family to continue the search. Now I can't speak for people who have read the book but obviously it doesn't stand up to critical appraisal (?). Sandra: But this is the first time that you give us a big interview not being arguidos, not being arguidos. Since then. erm. So now I feel free to ask you this directly. How can you explain the coincidence of the scent of cadaver found by British and not Portuguese dogs? Sandra: Ask the dogs, no Gerry? Now I feel free to ask you, don't you feel free to answer me? Gerry: Cadaver dogs, yes. That's what they have ensured us, if they are tested scientifically. Sandra: You read the files, Kate? Kate: Yes I have read the files. Sandra: What did shock you most? Any part of the... any detail that...you weren't... aware of? Something that has really surprised you or you didn't find anything? Kate: Oh I have been through them and I have made notes and I passed that on to our investigation team obviously. Sandra: And you found any evidence? Of anything? Kate: Well obviously the only evidence I wanna find is who has taken Madeleine and where she is. They are the key things and until we actually get that bit of information you know we are always gonna feel like we are a long way away. But basically what we are doing is trying to get as much information as we can and trying to put the jig-saw, jigsaw together, so finally we have the complete picture. Sandra: And what about your friends? Did you have a pact of silence with your friends? Kate: (laughing) You know the judicial secrecy? Sandra: I know it but we don't have it anymore. Sandra: Are you still friends? Do you plan another trips together or did it damage...? Kate: We are still friends. We haven't got any holidays planned but we are still friends. We are in touch with each other, we still meet up and see each other. Sandra: Don't you agree that there were a lot of details that in a certain way contribute to people to doubt of you, for example, when you went to the Vatican so quickly, all the contacts that you have made. Can I ask you Gerry, if you personally know Mr. Gordon Brown the Prime minister? Gerry: (moving on his chair uncomfortably) No, and We've still Never Met Gordon Brown. We have spoken to him once on the phone several weeks after Madeleine was abducted. People have got to remember that, and what today is about... good ordinary people wanted to help find an innocent missing child. And that's what happened. Clearly there was a huge amount of media coverage and people wanted to Look At ways to help. Our government wanted to assist the investigation to find The missing child. Sandra: Are they still supporting you, Mr. Gordon Brown still talks to you directly? Gerry: We have had continued meetings with both the Home Office and also with the Foreign Office to discuss ways in which the search can continue. Obviously today is a Prime example of law enforcement LED initiative with CEOP Within conjunction with other law enforcement agencies, Interpol, Europol, and you know, the key thing is, that law enforcement believe we can get information from those who may know. Sandra: How could you explain that Clarence Mitchell left the British Government where he was a press speaker to be your press speaker? Gerry: Obviously, when Clarence came first out to Portugal working for the Government at that time he came out and spent I think almost three, two to three weeks with us, and he got to know us very very well, and he felt very very passionate about the search for Madeleine and when the opportunity arose, erm, you know, we asked him if he would come back and shield us from the intense media interest and that is what Clarence has done superbly well, and he has become an extremely good friend during this. Sandra: But he must be paid.? Sandra: And now he must be paid? Sandra: Isn't it difficult for you to pay him? Gerry: You know, in the first period Brian Kennedy paid his salary and then he was subsequently paid by the fund and now, you know, he works part-time on this, and he is a consultant for Freud Agency, so, you know, as the media interest dropped down, we haven't needed a full-time spokesperson. He still works with us, we are working very closely with him and he has done a brilliant job protecting us and allowing us to have some degree of normality as a family considering the very very intense media interest. 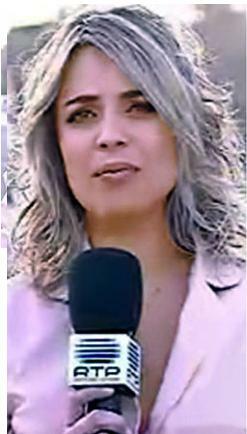 Sandra: You have also hired a new communication agency back in Portugal. Why do you think you need it and is it easy for you to afford it? Sandra: Until when do you think that you will afford all this? Two lawyers in Portugal, a news agency, Clarence Mitchell... I don't know if you still have the two lawyers that you have hired here in London? Sandra: But don't you feel strangled? Don't you feel that some day you feel it will be finished the money? Sandra: And how do you do it? Gerry: Well, you know, people have been extremely kind. You have to remember that the fund was set up initially because so many people offered money to try and help and wanted to help and were prepared to donate. We would love nothing better for Madeleine to be found and for the remaining moneys in the fund to go to helping other families of missing children both in the UK and in Portugal, and that is one of our objectives when we have found Madeleine... AND her abductor, then the moneys will be used for that. Obviously if the money runs out... is running out, then we have to look at alternative ways of fundraising erm We've Done small events community events, which have been very good for teambuilding. We have had a small auction in Madeleine's school and the school where the twins are. Sandra: Do you still have the support of Mr. Richard Branson, JK Rowling, this multimillionaire that initially gave you a lot of money? Gerry: (burblegurgle) ..an independent investigation that has been funded completely out of Madeleine's fund... I mean an event like today, there is no specific Cost for it, and this is obviously the internet, people already have subscriptions, they can do this. There is the willingness of the population to help and I think we will find hundreds of thousands if not millions of people today will forward this link to their contacts in countries all over the world. That is cheap. Sandra: Do you still have money in the fund? Gerry: There is some money still in the fund and it continues to be used and we will use every single penny in that fund in the search for Madeleine. Sandra: You have asked Goncalo Amaral to pay you 1 million euros for damage erm for the defamation for example. Do you need that money to finance the campaign? Kate: The reason why we have taken action against Goncalo Amaral is the damage that he has done for Madeleine. That's our main focus. Sandra: Which motives could he have to make up all this story? Gerry: We can't speak for Goncalo Amaral. Kate: It has to be financial gain, hasn't it? Sandra: You think that he made this with the commercial perspective? Kate: You would have to ask him to get the answer to this. Sandra: So this is your idea? Sandra: You think Goncalo Amaral is trying to win money playing with your, erm your child's life? Kate: We have to wonder why an ex-inspector of the PJ would want to convince the population that Madeleine is dead, with absolutely no evidence whatsoever. And that question should be asked. Sandra: Do you feel that there is a difference of treatment between the Portuguese authorities and the British authorities? In any moment did you feel, or do you feel still, that you were victims of the Portuguese investigation? Gerry: The key victim is Madeleine. I mean, that's what the crime is about. We know we had to be investigated. And we have been investigated. Sandra: So have you forgotten everything that already passed? It's passed for you both? Kate: The only thing we can do now is look forward, you know, you know. There is lessons to be learned by everyone ourselves included, from what's happened. But, all we want to do is find Madeleine and the only way of doing that is by looking forwards and trying to be proactive and see what we can do now, which is why this message has gone out today. Sandra: Did you go back to work? Are you working already? Kate: I am working fulltime in the campaign to find Madeleine. I am looking after Sean and Amelie. Sandra: You don't have any plans to go back to the clinic? Sandra: You don't. And talking about the twins. Now the time is passing. Two years and a half since Madeleine disappeared. They are growing up. How will you be able to explain them what happened one day they have the age to really understand it? Gerry: It's like filling in a picture for them with the information we have available and we will give them as their minds inquire, and as they are able to handle that information, then we will answer all of their questions openly and honestly. Gerry: Well, we will answer the questions. So what they ask us we will tell them. And we tell them exactly what happened and what information we know. And what we do know, is that we are continuing to look for their sister. They want people to look for their sister. Sandra: But will you go into details about what happened? Kate: We will be led by them. We have had advice from a child psychologist and they said Sean and Amelie would lead the way. If they ask a question answer them honestly. We are not gonna rush them, but if they ask something, then obviously we will answer them. Sandra: They are in the same school where Madeleine was? Gerry: Well she didn't get a chance to start yet so, she was there, her place is there, and the twins are there now. Sandra: The room, Madeleine's room is still the same? Kate: The bedroom? Yeah, it's quite a few more presents in it now, but yeah, it's still the same. Sandra: And what do you keep telling the twins whenever they ask for her? I presume that they ask about her a lot of times? Sandra: Is it still very hard for you or are you getting used to this reality? Are you trying to live with it? Sandra: You told me once that you are both living a nightmare. In your more optimistical perspective, what do you imagine, what do you think, it could be the best way to recover Madeleine. Gerry: I think, the first thing today is that this message, it can be downloaded and distributed, get heard and seen by someone who knows, and it will tweak their conscience and get them to give information to bring Madeleine back. Sandra: The last lead that you have shared with us was about a women in Barcelona. Has this anything to do with this appeal? (Kate shakes head?) Is it for that, that you are asking the relatives of people that can be involved in her disappearance, to call you? Gerry: I think the first thing to say is that the investigation ,matters are to be dealt with by the professionals and obviously we have got David Edgar working for us or law enforcement as appropriate. Today is about this appeal. It is completely separate. It is going out in seven different languages, we want it to be spread as far and as wide as possible because we don't know where Madeleine is and we don't know who took her and that's why we need the public's help to spread the email, an email to all your contacts. I know you have already done it, Sandra. Sandra: Thank you very much to you both.